Release Message: When Lilo (Daveigh Chase) runs home to find out what was going on, Jumba explains that she and Stitch had been gone for 20 years. Description: Skip, A.K.A. Experiment 089, is an illegal genetic experiment created by Jumba Jookiba. He is designed to skip a person's life by one decade when they press the button on his head; he also has a reverse setting that will return the person back to the present day. His one true place is as an amusement park ride showing people what it would be like in the future. At an unknown point, Experiment 089 was activated and taken in by the dog shelter. 089 was adopted from the dog shelter by Lilo and named Skip. After Jumba explained Skip's powers, Lilo, who had grown tired of childhood restrictions, used Skip to skip her and Stitch ahead ten years and become a teenager. When Lilo discovered that adolescence was a lot more difficult than childhood, she used Skip to travel forward another ten years and become a full-fledged adult. However, Lilo, Stitch and Skip were sent into an alternate future ruled by Hmsterviel. Lilo was puzzled by this, but before she could ask someone about it, Stitch and Skip were captured by Clink and taken to Gantu, despite Lilo's best efforts to protect them. 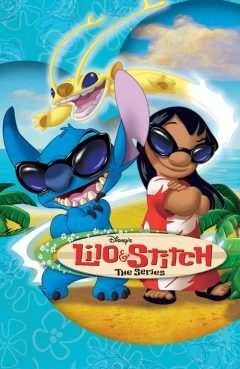 Lilo, Stitch and Skip in the present When Lilo ran home to find out what was going on, Jumba explained that since she and Stitch had been gone for 20 years, no one was there to catch any experiments except Gantu. Later, Stitch and Skip were rescued by Lilo, Jumba and Pleakley while Gantu was distracted. Lilo then used Skip's reverse setting, which Jumba revealed, to return her and Stitch to the present. Additionally, Lilo realized that being a child had its advantages.